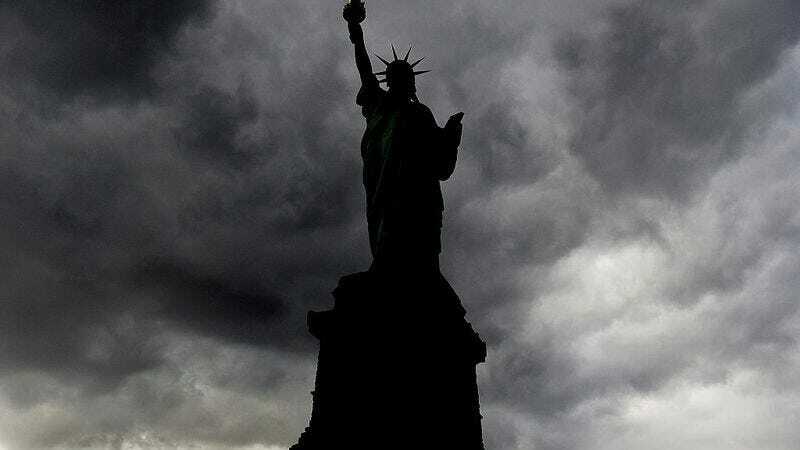 Multiple sources—including New York news broadcast PIX 11—are reporting that the lights around the Statue Of Liberty have gone dark tonight, with no official reason on the books. Online commentators, including the ones who run the Twitter account for The Women’s March, are speculating that it’s intended as a gesture of solidarity for tomorrow’s International Women’s Day and the A Day Without Women event, a widespread strike intended to display the impact women have on America’s workplaces and culture. The Statue Of Liberty is run by the National Park Service, a governmental department that has had a number of run-ins with the White House since Donald Trump took office back in January. Of course, it’s always possible that this is just a bizarre coincidence or power outage, and that no political intent is actually meant by the sudden darkness at the Statue. But for now, numerous people—ourselves included—are reading it as a powerful symbolic show of support for America’s women and their cause.